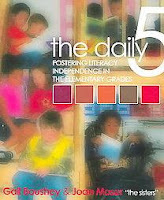 One of my favorite quotes from Chapter 7 is ""One of the advantages of the Daily Five is that the structure allows for uninterrupted blocks of time to work with children in a one-on-one situation." I am feeling empowered by this aspect of Daily 5. I love the idea of "conferring notebooks" which "become our diaries and documentation" and show "our plans for where to go next, allowing for differentiated instruction." Education is all about differentiation for the individual child, as it should be. Daily 5 will be the support I need in being able to give my students more of what they need! SHAZAM! I've been working in my room, rearranging so that we have a gathering place, library, and lots of small private work spaces that I can see from my work space. Student loved sharing the rocking chair as well as the ottoman in my class last year. I'm adding another chair and possibly a bean bag this year. It's exciting to be able to offer children the choice for which spot is "the best place for your brain and body to work." I love how the sisters even have an "Ignoring the Teacher Focus Lesson!" That cracks me up! To top it off, I have my class list for the 2012-2013 school year and I will most likely have to use that particular lesson. YIKES! The Check-In page in Figure 7-1 on page 94 is something I can also create now that I have my class list. YIPPEEE! I believe the time I've spent this summer reading and blogging about the Daily 5 has been some of the best time I have spent this summer. Thank you to everyone who participated in this book study. Thanks for sharing your ideas and methods. I applaud you! May God bless you 100-fold!